Awesome to see underwater, the Manta Ray is an enormous fish spanning. They live in warm waters around the world, gracefully flying through the water with steady sweeps of their giant wings. Where to dive with the Giant and Reef Manta Rays? Until recently people believed there was only one species of Manta Ray: Manta birostris. 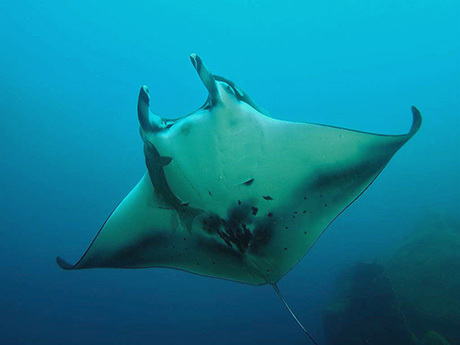 Now though, researchers have observed that there are actually two: the Reef Manta Ray (Manta alfredi) and the Giant Manta Ray (Manta birostris). Both species of Manta are found around the globe, their ranges overlapping in some places like Mozambique. Indonesia: Komodo, Bali and Raja Ampat - Reef Mantas. Manta rays are curious creatures and if you stay still whilst diving near them they will often come over to have a look at you. 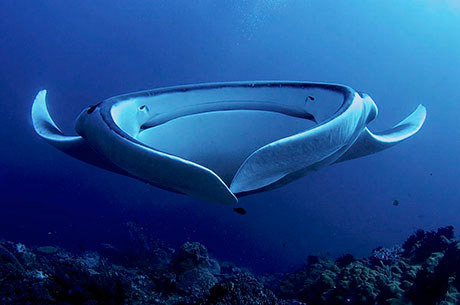 Dive tourism involving Mantas is a growing industry. More money is made from live mantas than from the dead, caught mantas. A recent study estimates direct revenue to dive operators from manta ray dives and snorkels to be over US$73 million annually. Money made from associated tourism expenditures is put at US$140 million. However, tourism related industries can also negatively impact individual behaviour, entire populations and critical habitat. Tourism needs to be developed responsibly, with the needs of the animals respected. The Giant Manta Ray appears to be a seasonal visitor to coastal or offshore sites. While this species seems more solitary than the Reef Manta Ray, Giant Manta Rays are often seen aggregating in large numbers to feed, mate, or clean. Sightings of these giant rays are often seasonal or sporadic but in a few locations their presence is a more common occurrence. At certain times of the year you can see the Giant Manta Ray at aggregation sites such as the Similan Islands, Thailand; northeast North Island, New Zealand; Laje de Santos Marine Park, Brazil; Isla de la Plata, Ecuador; Cocos Island, Costa Rica; and the Revillagigedo Islands, Mexico. Being oceanic, you see them less frequently than the Reef Manta Ray. Reef Manta Rays do not commonly venture from coastal waters, often moving between inshore cleaning stations and feeding areas. The can grow to 5 m across, however, most mature individuals do not exceed 4 m. Komodo, Bali, Raja Ampat, the Maldives and Mozambique are all great places to dive with them. Why are Mantas so Big? Completely harmless filter-feeders, Manta rays use their head fins to direct plankton into their mouths. 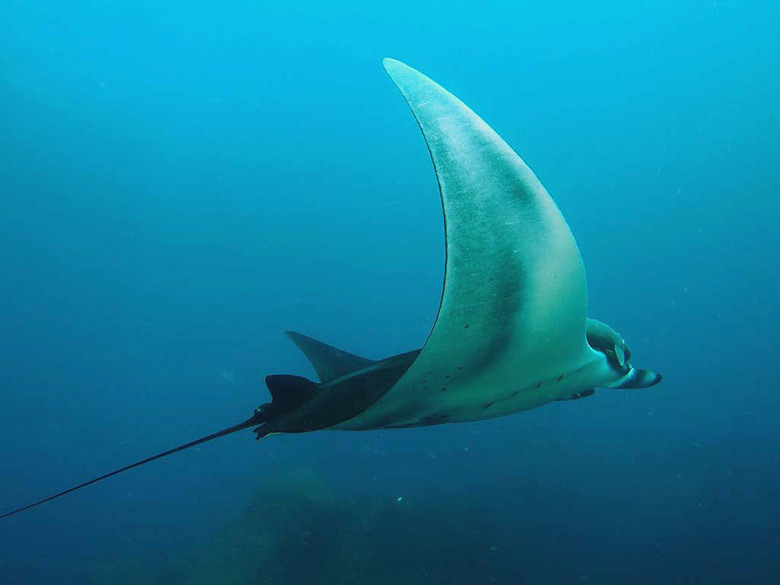 As plankton occur near the surface of the seas, that's where Mantas are also found. Filtering your food out of the oceans doesn't take much energy, which is why Manta rays can be so large. Manta rays sometimes leap out of the water, falling back with a splash. This is thought to remove parasites, or perhaps be a show of territorial rights. However, Mantas collaborate when feeding and follow the plankton, so the latter seems unlikely. Both Giant and Reef Mantas have been classified as vulnerable in the IUCN Red List. Giant Mantas migrate vast distances, crossing international boundaries, in search of food. Products from manta rays have a high value in international markets, and targeted fisheries hunt them for their valuable gill rakers used in traditional Chinese medicine. Monitoring and regulation of the exploitation and trade of both manta ray species is urgently needed, as well as protection of key habitats. Another factor which adds to the vulnerability of the Manta ray is its low reproductive rate. In the wild, females bear on average only a single pup every two to three years. 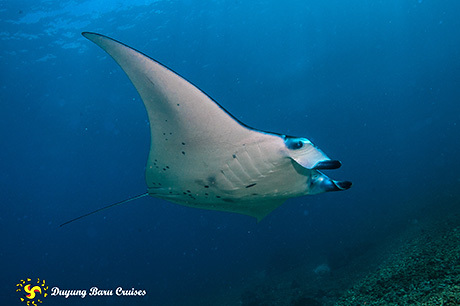 Female mantas are thought to mature at around 8 to 10 years of age and to live to around 40 years. Manta and devil ray catch increased from 900 tonnes to over 3,300 tonnes between 2000 and 2007. O�Malley MP, Lee-Brooks K, Medd HB (2013) The Global Economic Impact of Manta Ray Watching Tourism. PLoS ONE 8(5): e65051. doi:10.1371/journal.pone.0065051.